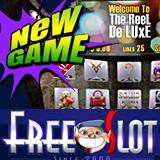 One of the world’s most popular free online slots sites has added yet another free casino game, the Reel De Luxe. FreeSlot.com now has seven unique games and continues to award cash prizes to daily slots tournament winners. Dedicated to shoppers with a taste for the finer things in life, the new Reel De Luxe is a luxurious five reel video slot with 21 pay lines and three exciting bonus features. All games at Freeslot.com are completely free to play. Thousands of players enter daily tournaments, winning $10, $25 and $50 cash prizes. More than $220,000 has been awarded to date. Freeslot has quadrupled its player base over the last 12 months and, to satisfy the demand for great free slots, is committed to introducing another new game every month in 2013. No bargain hunter can resist a good sale and in this game three scatter "Sale" symbols wins a discount from 10 to 100 percent on the next three spins. Three scatter "Present" symbols give a special gift. Three "Bonus" symbols trigger a bonus round where players select symbols to reveal prizes. Reel De Luxe will be the designated tournament game today and then once every week. Other free slots games featured in daily slots tournaments are: Lucky Go Round, Heavenly Reels, Tropical Treat, Win A Fortune, Wheeler Dealer and Vegas Mania. Delighting online slots players with free slot games since 2000, Freeslot.com offers more free slot tournaments with cash prizes than any other free slots site. It also pays to visit the Freeslot page on Facebook where extra perks are often offered.